I encourage you to understand the BFS algorithm before continuing this article, as you'll understand the information presented here a lot better. 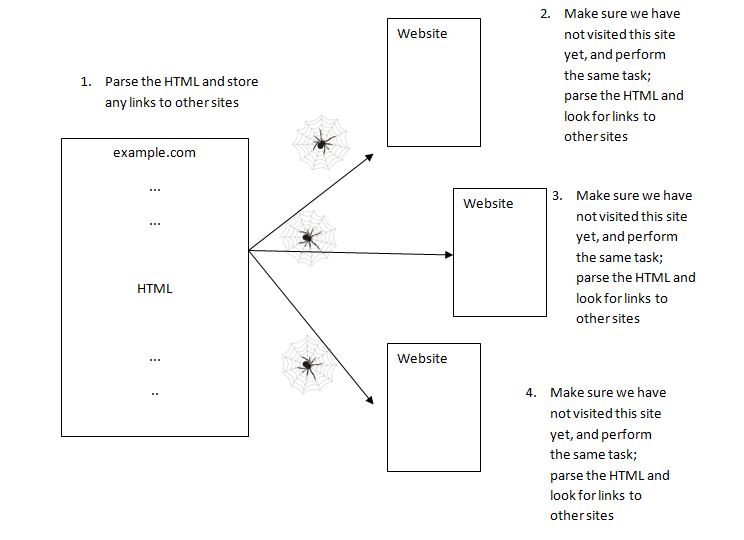 So, as is shown in the diagram, we have an initial website where we will start our crawl, and every URL within that website will be crawled if it hasn't been visited. 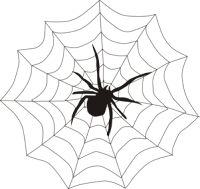 Now the problem comes down to 3 factors: Choosing a mechanism for keeping track of visited sites, pulling the HTML from a given site, and how to recognize valid URL's within the HTML of a page. The first factor, choosing how to keep track of visited sites, is easy to accomplish: A Map Data Structure! More specifically, for the best performance, a hash table where the keys to the table are the URL's and the values can simply be a boolean. Although you can use a BST or any other implementation of a Map if you'd like, I believe that a hash table will be the best option due to its benefits over a BST, and we don't necessarily need ordering of our data. The second factor, reading the HTML from a website, can be easily done in C/C++ using an external library such as libcurl . Java also allows you to do this without any external library, and many other languages also allow you to extract the HTML from a webpage, so this problem can be taken care of on a language-to-language basis. The third factor, how to recognize valid URL's from within the HTML of a page, can be done with a regular expression match. Most languages now have support for regular expressions, so this shouldn't be an issue. We'll cover the actual regex syntax for matching the URL later. Due to the fact that the implementation of this in C++ will rely on an external library, I will present the code for the algorithm in Java, but I will have the C++ version available for download separately for those who wish to view the C++ version of the algorithm. 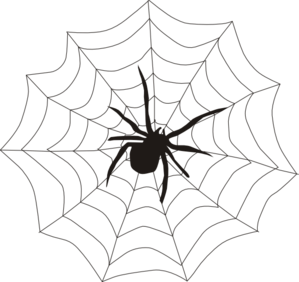 Before we get started, this algorithm needs a starting point; a website where it will initiate its crawl. For purposes of demonstration we will use http://example.com ( yes this is a real website). Finally to the coding! We will need the necessary boilerplate code that will setup the Queue needed in BFS. With out boiler plate code ready, all we need to discuss now is the regular expression syntax for matching valid URL's. There are plenty tutorials scattered throughout the interwebs regarding regular expressions, but in essence our syntax will be the following: "http://(\\w+\\. )*(\\w+)" which will match "http://" followed by any sequence of 1 or more alphanumeric characters, followed by a . ( the period which occurs in .com , .net, .org, etc,). This sequence can occur multiple times ( such as in the case of websites of international domains). Then followed by one or more alphanumeric quantities ("com", "org", "net", etc). If this sounded foreign to you, please visit This Regular Expressions Tutorial Website to learn the regular expression syntax. Note: The reason we have a try/catch block is because some websites may be offline or not valid sites anymore, in which case, the Java Runtime will throw an exception which would otherwise halt program execution. In this case we silently "ignore" the exception by choosing to do nothing. The code presented here is pretty straightforward: we have a queue with which BFS feeds off of, a hash table storing the sites we've already been to, and we start the crawl on a sample website. The BFS algorithm will continue to poll websites off the queue and process them (in this case we print them to the console but you can store them to disk, or any other useful task) and read their HTML, match any URL's with a regular expression,then check to make sure we haven't already been to that site, en-queue it and mark as visited. Although the example code is in Java, this can be ported over to other languages. If you enjoyed this article, please Subscribe to get updated with my new blog posts as well as newsletters. Very informative, indeed. Thanks for taking the time to explain this!